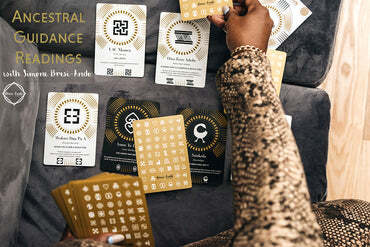 The Adinkra Ancestral Guidance cards are a 44-card deck that help you channel information, messages and direction from your ancestors using the power and philosophies of Adinkra symbols. 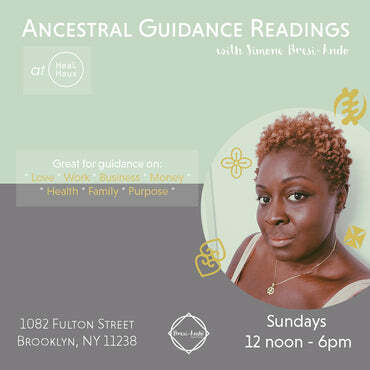 They are specifically poised to help harness your ancestral power and connect to the spirit world on a deeper, more accurate and personal level. The deck displays 44 Adinkra symbols with their pronunciations, meanings and expanded explanations in the enclosed guidebook. The beauty and uniqueness of these cards are that they use the ancient, visual, philosophy-based, communication system of the Adinkra - never before has it been used in this way. This is the first of it's kind. The guidance cards join the Adinkra Intention Candle range from the brand and are a perfect accompaniment to creating the optimum atmosphere for you to receive messages during divination. The Bresi-Ando Tools For Living brand creates a variety of lifestyle products and home goods that centre a West African and spiritual context.